The best eyeliner can brighten eyes, define features, and give a polished look to your makeup. With so many choices, deciding on the right eyeliner can seem overwhelming. You want to find something that creates the look you want. Crisp lines, easy application, and staying power are only a few of the important features to look for in the best eyeliner. A bold liquid or subtle pencil eyeliner will give different looks but you still want a liner that won’t run down your face or disappear as the day goes on. 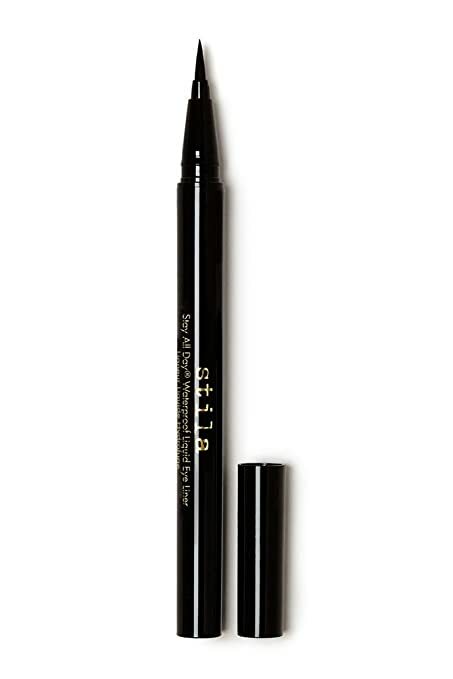 The stila Stay All Day Waterproof Liquid Eyeliner (stila) is a powerful eyeliner that will last the entire day. It comes in 15 colors – intense black, alloy, amber, cobalt, dark brown, emerald, indigo, midnight, moss, olive, paradise pink, periwinkle, teal, turquoise, and white. The stila Stay All Day Waterproof Liquid Eyeliner comes in so many color choices that you are sure to be able to find a shade that works best with your skin color or the mood you are trying to create. A subtle hue like dark brown for daytime gives you a polished professional look. While a shade like paradise pink, can give you a wild pop or color for a night out with friends. The felt tip applicator on the stila Stay All Day Waterproof Liquid Eyeliner allows you to create any level of intensity that you want. This kind of tip provides versatility in the types of lines that can be created. The fine tip creates a small delicate line necessary for the inner eye and, as you move towards the outer eye, with more pressure a bolder line can be created. The applicator also doesn’t pull on the delicate skin around your eyes. The formula of the stila Stay All Day Waterproof Liquid Eyeliner is designed to go on smooth, which is important to getting a crisp line. It resists smudging so the occasional brush of a finger isn’t going to ruin your makeup. The combination of the formula with the applicator also prevents tugging or skipping while applying. Some formulas create splotches as they go on but the smooth formula of the stila Stay All Day Waterproof Liquid Eyeliner has a continuous line for an easy application. It also dries quickly so you won’t get eyeliner on your eyelid after application. Rain, tears, and sweat can cause eyeliner to run down the face, creating a colorful mess. A waterproof formula, like the stila Stay All Day Waterproof Liquid Eyeliner, stays in place so you won’t be caught with embarrassing streaks on your face. You don’t need to worry about getting caught in the rain or a night out at an emotion-packed movie. Applying liquid eyeliner can be tricky at first. Because the stila Stay All Day Waterproof Liquid Eyeliner feels like a felt tip pen in your hand, most beginners are able to learn to use it fairly quickly. Getting the right look begins with proper use and application of the eyeliner. It is recommended to gently pull on the out corner of the eye to smooth the skin before application. This preparation helps to prevent the bleeding of the formula to other parts of the eyelid. Apply the liner as close to the eyelashes as possible. You can get the liner into the eyelashes by applying with a feathered stroke. It is easiest to start where the brush naturally falls from your hand. This will be different for right and left-handed people. Create a subtle look with a thin line or go exotic with a cat eye. You can use the fine tip to outline the shape that you want and fill it in once you’ve got it perfected. 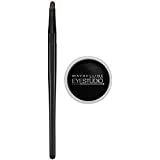 The Maybelline New York Eye Studio Lasting Drama Gel Eyeliner (New York) provides a smooth line with all day wear. Gel liners have some benefits many users prefer. 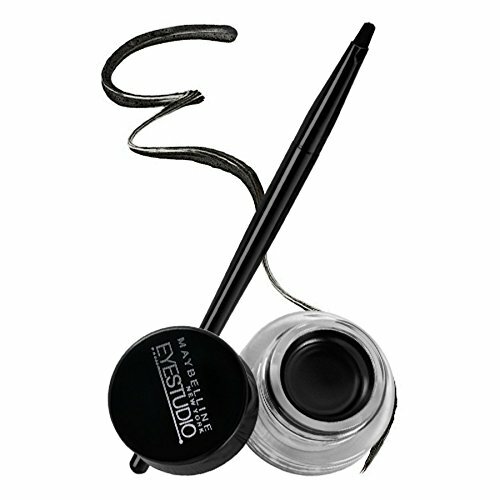 Gel liners allow you to apply with a brush, much like painting. This gives you good control over the eyeliner as it goes on. Line thickness is easier for some to control with a brush. There is less tugging on the skin, making application gentle. Gel liners tend to stay on the skin well. Gel liners also blend more easily than liquid eyeliners, giving more options for the kind of looks you can do. You can have the benefits of a liquid with blending abilities that are more like a pencil. The Maybelline New York Eye Studio Lasting Drama Gel Eyeliner uses a clear gel base to hold a high concentration of pigments. This gives you exceptional coverage with each stroke. It creates a dark line for good definition. The New York uses an oil-free formula for those with sensitive skin. Contact wearers can also use the Maybelline New York Eye Studio Lasting Drama Gel Eyeliner without ill effects. Oil-free also helps the eyeliner stay in place in hot humid conditions. The formula goes on smooth and resists smudging. Resisting the urge to touch your eyes during the day can be difficult. The occasional rub of the eye isn’t going to smudge the Maybelline New York Eye Studio Lasting Drama Gel Eyeliner. It is also waterproof. If you find yourself caught in the rain or dabbing your eyes at the movies, this eyeliner will stay in place. Many users enjoy the fact that it doesn’t flake or crack, allowing them to maintain the look they want throughout the day. Maybelline New York Eye Studio Lasting Drama Gel Eyeliner also dries quickly so you don’t have to keep your eyes closed for five minutes while your eyeliner dries. On the downside, it dries so fast that any mistakes must be corrected quickly otherwise you may have to remove your eye makeup and start over. An applicator brush is included. Using the brush takes some practice, but once it’s mastered you’ll be able to create a variety of looks to meet any situation. It can be used to create a thin delicate line or a thick dramatic line. It is best to start at the inner corner of the eyelid and work to the outside of the eye. This way you can work from the thinnest portion of the line to the thickest and taper it the end. Another quick tip for using a gel liner is to put small dots of liner close to the lashline. Then, connect the dots to get a well-defined straight line. The Maybelline New York Eye Studio Lasting Drama Gel Eyeliner comes in four colors – blackest black, brown, charcoal, and eggplant. The applicator brush needs to be cleaned and dried after each use to prevent the buildup of excesses liner and to prevent the growth of bacteria. The Milani Eye Tech Extreme Liquid Eyeliner (Milani) is a quality formula that goes on smooth for a well-defined line. It dries to a matte finish. A felt tip applicator comes to a fine point, allowing you to create different line thicknesses as you apply more pressure. Using the end of the tip, you can get the innermost corner of the eye and work your way out towards the outer corner. You can also use the fine tip of the Milani Eye Tech Extreme Liquid Eyeliner to create delicate outlines that can be filled in to create more dramatic looks. Liquid liners have been known to seep into the fine lines and cracks of the eyelid. 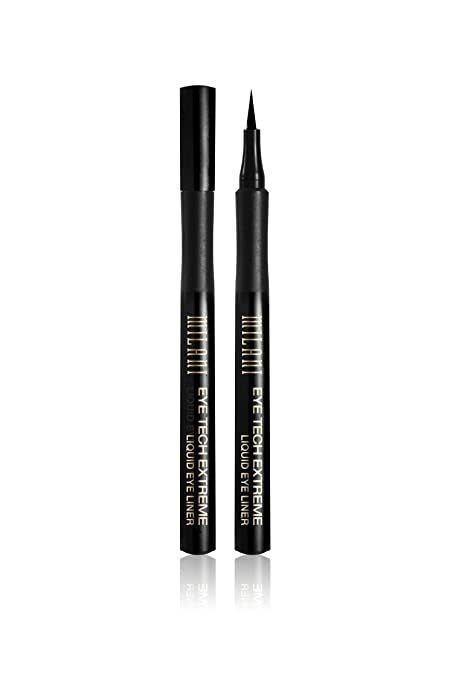 The formula of the Milani Eye Tech Extreme Liquid Eyeliner is created to resist feathering or bleeding. With the Milani, the liquid stays where you put it to create the definition you want. Using waterproof eyeliner, like the Milani Eye Tech Extreme Liquid Eyeliner, prevents you from having to worry about eyeliner running down your face. Tears, rain, or an unexpected spray from a hose won’t ruin your look. The Milani will stay sharp and crisp all day long. It can be removed with makeup remover or similar cream based remover. Water alone won’t do the trick. The Milani Eye Tech Extreme Liquid Eyeliner glides on smooth and can be applied with a single stroke after some practice. This can save you time when getting ready. Easy application is the favorite feature of many users. It not only saves you time but also leaves results that are comparable to a much more expensive product at a fraction of the cost. The water-based formula of the Milani is gentle enough for sensitive skin, while also resisting the effects of heat and humidity. The Revlon ColorStay Eyeliner (ColorStay) is the only pencil on our list. Pencils tend to be hard on the skin and wear off quickly but not so with the ColorStay. It comes in eight colors – black, black-brown, brown, charcoal, amethyst, jade, sapphire, topaz. With its low price and color choices, you can own several Revlon ColorStay Eyeliner pencils. You’ll be able to have fun shades like amethyst and topaz for a fun night out and shades like charcoal and brown for office use, giving you lots of versatility. A benefit of a pencil eyeliner is their ability to blend with other makeup. You can create a hard line like that of a liquid liner, but you can also smudge and blend it for a softer look. Making pencils a good choice for daytime wear or for someone just beginning to wear makeup that would prefer a more subtle appearance. The smooth application makes it a favorite for those that are trying to avoid the tugging often associated with pencil eyeliners. As it goes on smooth, it can enhance your features rather than damaging your delicate skin. No one wants an eyeliner that melts away or smudges off. The Revlon ColorStay Eyeliner can last up to 16 hours giving you good coverage for most of the day. It won’t smudge with the occasional touch to the eye; however, it still maintains the ability to blend when desired. Another common problem pencil liners have is keeping a sharp edge to create a clean line. The Revlon ColorStay Eyeliner has a built-in sharpener so that you can keep the pencil at its best at all times. You can take it with you while you travel and there are no worries that it will break and leave you without your favorite liner. 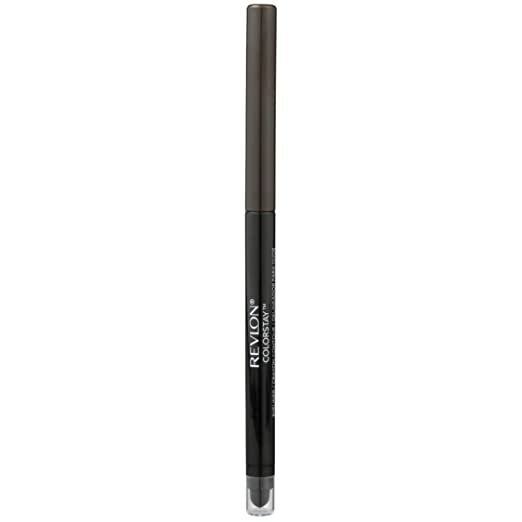 Revlon ColorStay Eyeliner is also waterproof so that you can wear it in any kind of weather conditions. It holds up fairly well to sweat as well as humid conditions. 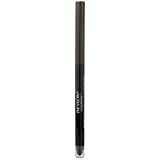 The Revlon ColorStay Eyeliner is gentle and non-irritating for those with sensitive eyes or who wear contacts. Gentle cosmetics, like the ColorStay, are safe to use and don’t have detrimental effects. There are several types of eyeliner, each with their own strengths and weaknesses. The basic types are liquid, gel, cream, and pencil but within those types are different designs, formulas, and applicators to consider as well. It goes on dark and leaves a highly-defined line. They are a favorite of diehard makeup wearers for the variety of looks you can create with them. Depending on the quality of the formula, liquids will stay on the longest. The problem with liquids is that they are unforgiving. It can take time to learn how to apply them properly and they take longer to put on as you have to be more careful. They have the potential to run badly in the rain or if your eyes water, making waterproof formulas the most reliable. Some formulas have been known to bleed or feather, flake, and crack. It’s best to check reviews or ask a friend what kind she uses to avoid formulas with this problem. They are relatively new to the makeup world. They come in a pot with a separate applicator brush. They go on similar to liquid eyeliner but usually offer a bit more flexibility as they can be blended more easily than liquid. Depending on the type of brush used, you can create a variety of looks from those with thin delicate lines to those with bold, thick, flared lines. Gels stay on well and don’t tend to flake or crack. The applicator brush needs to be cleaned after each use and it can take some time to develop good technique. They are great for those first learning to use eyeliner as they are easy to apply and blend easily. They are forgiving of mistakes because they can be easily removed. Unfortunately, they also smudge and rub off the easiest. It is the old standard and is usually the least expensive. They are not as intense as liquid or gel and can be blended easily. Many people start with pencil eyeliner before they move on to other types. They come in many different colors providing great variety. However, pencils break, tug, and don’t always go on smooth. Look for a pencil that goes on smooth and gentle for the best results. When it comes to liquid and gel eyeliner, there are several different applicators from which to choose. Choosing the right kind for you may take some trial and error. Liquids can come with a felt tip, brush, or pen-like applicator. Felt tip and pen applicators are a favorite because they are applied in a similar manner as a pencil, with which most are familiar. They allow you to create fine or thick lines depending on the pressure applied and the angle of the applicator. Both of these types of applicators have been known to dry out quickly. Once they begin to dry out, they can fray and start leaving splotches of color. Brush applicators work like nail polish. The brush is attached to the lid and paints the eyeliner on. They put on a good amount of formula but it can be difficult to create different line thicknesses. Gels are applied with separate applicator brushes. Angled brushes allow you to vary the line thickness quite easily. Some gels come with a good brush while others may require a separate applicator brush to get the best results. It may take some practice to get used to using a brush. If you’ve never used eyeliner before, a pencil is a good place to start as the movements needed to apply pencil eyeliners are familiar. If you are ready to branch out and try something new, find a liquid that has an applicator similar to a pencil for the easiest transition. All formulas are not created equal. Waterproof formulas stay on the longest but can be difficult to remove. However, if you live where it is humid or rains frequently, you may need waterproof eyeliner to prevent dark streaks from forming under your eyes. Look for formulas with high pigment content as they will cover the best and won’t require more than one coat. Higher pigment content usually means smooth application that will give you clean, crisp results while also preventing any damage to the sensitive skin around the eyes. Read reviews as inferior formulas can smudge, rub off, flake, or crack. If you have sensitive skin, eyes, or wear contacts you are going to need to be careful about anything you apply close to the eyes. Some formulas are created specifically for those with sensitive skin and eyes. Water-based formulas are the most gentle and the easiest to clean off at the end of the day. You may want to apply a little of the eyeliner on another part of your body to check for any initial reaction before putting it on your eyes. Finding good eyeliner is, in large part, a matter of personal preference, especially when it comes to the type of eyeliner you choose. The time you are willing to spend putting on eyeliner can help you narrow down your choices. Liquids and gels take the longest but have strong staying power, while pencils are easy to apply and have a softer look. As you balance price and good formula, you’ll be able to find a good eyeliner that will be able to give you the look you want, at a price that won’t break your beauty budget.